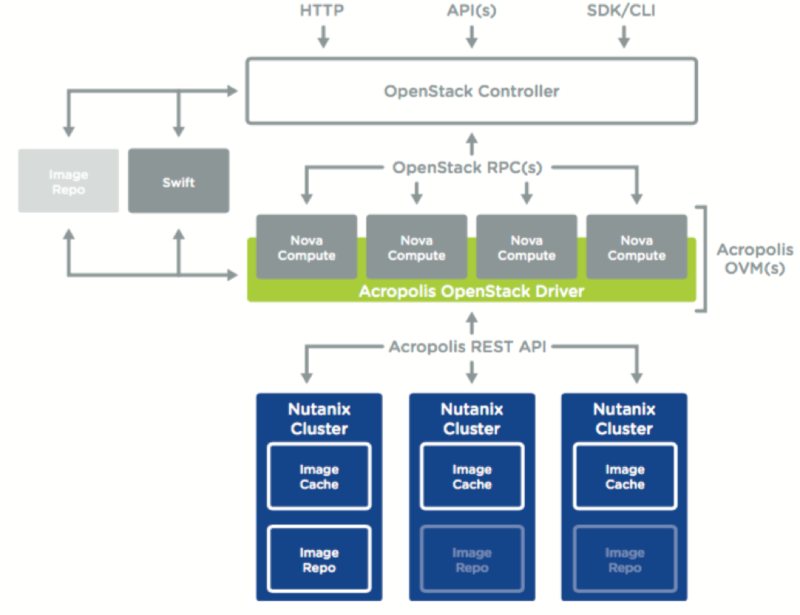 Where does Nutanix fit with my OpenStack environment? OpenStack is a powerful tool for many organizations, especially those looking to give their IT users the Infrastructure-as-a-service (IaaS) experience they would get with the public cloud. It also provides a neutral ground for your infrastructure, allowing you to integrate your entire stack into a single automation plane no matter how many vendors are involved. Starting in AOS 4.6 Nutanix AHV offers full integration with your choice of OpenStack controller, as long as you run version Kilo. Let’s take a look at how this works! The OVM is also available in an all-in-one mode for test/dev and lab environments that provides both the drivers and OSC in a single package. The OSC in this mode is very simple to deploy. However, it’s important to note that in all-in-one mode the drivers are supported by Nutanix but the OpenStack deployment is not. An OpenStack deployment is made of many layers, depending on the features and services you require. At its core, however, is the infrastructure. Cinder, Neutron, and Nova provide the resource management needed for storage, networking, and compute respectively. Glance provides images for your users to deploy VMs from. Turnkey - Nutanix provides simple to use building blocks for private clouds. You can easily scale compute and storage linearly removing bottlenecks common with 3-tier architecture. One-click operations for cluster expansion and rapid procurement means that you have what you need when you need it, saving on expensive overprovisioning. Simple – Nutanix Prism offers integrated break-fix procedures for all the hardware and proactive monitoring for things that might cause problems down the road. Prism now also offers predicative capacity planning, allowing you to easily see based on your growth rates how long your infrastructure will last, including ways to squeeze the most out of it by identifying stale and overprovisioned VMs. Resilient – Nutanix Acropolis offers automated self-healing and a rich set of options to keep your critical data safe, including integrated data protection and VM-centric features such as VM Snapshots, live migrations, and high availability. In a study by IDC, Nutanix environments had 98% lower unexpected downtime compared to traditional systems. Integrated – With Nutanix Acropolis providing built-in storage and virtualization with AHV, the entire infrastructure is delivered from a single vendor, radically simplifying integration and giving you single-number support for all your infrastructure needs. As an integrated stack, Prism offers one-click non-disruptive software management for everything in the infrastructure (BIOS/BMC/Storage/Hypervisor) meaning there’s no need for expensive professional services to upgrade your system or long planning periods to avoid issues. And that’s just the beginning! 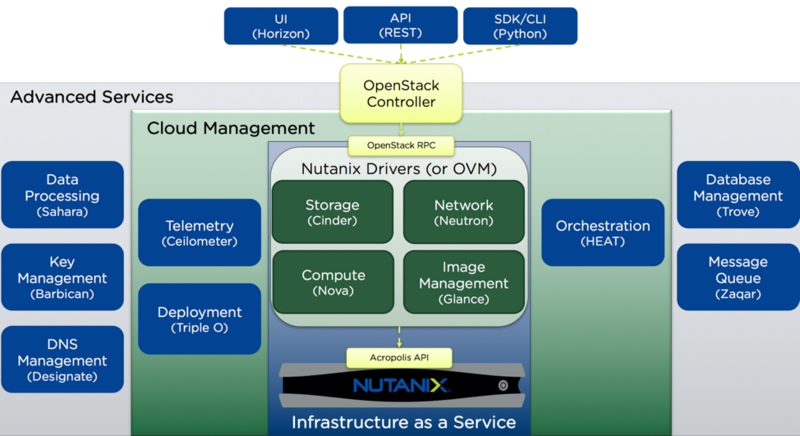 There are many benefits to backing your OpenStack deployment with Nutanix infrastructure. To learn more (and to download our CE edition to play with AHV for yourself) be sure to visit the Next forums at next.nutanix.com, follow us on Twitter and be sure to come visit us at the OpenStack Summit next week (we’ll be there with Intel). I wanted to know if the OVM concept will work on Hyper-V as I have Hyper-V on Nutanix. Hi jsam316, Currently we support only AHV, in future when we upgrade our API set(which now works on ESX and in future HyperV) we should be able to support HyperV. Hello, i need more information about Nunanix and OpenStack integrations, i work at a Nutanix Partner in Ecuador and one of aour customers needs to provide cloud services.